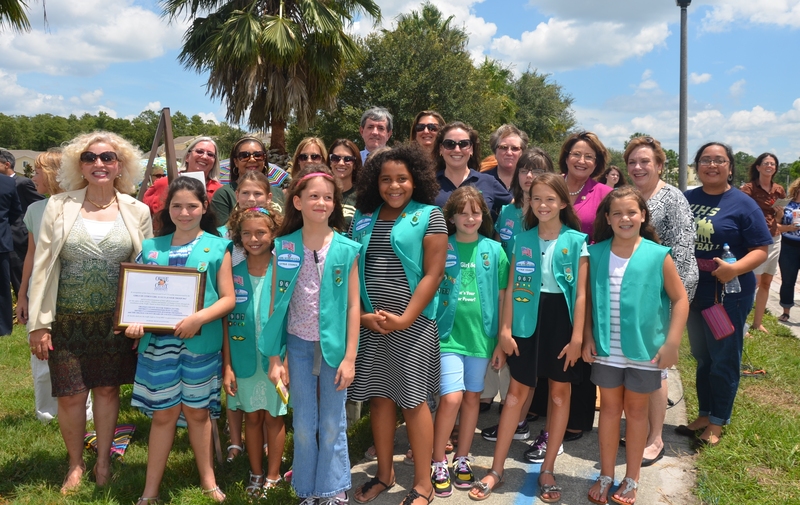 Orange County Mayor Teresa Jacobs recently highlighted the efforts of members of Girl Scouts Junior Troop 967, who had requested the installation of a new traffic signal near Cypress Springs Elementary School in 2012. Mayor Jacobs was accompanied by District 3 Commissioner Pete Clarke and District 4 Commissioner Jennifer Thompson to celebrate the efforts of the Girl Scouts Junior Troop and the official activation of the traffic signal at the intersection of Dean Road and Cypress Springs Parkway in Orange County. Mayor Jacobs presented an award plaque to the girls and unveiled a permanent sign at the intersection, which dedicated the signal to Troop 967 and commended the group for their efforts. Troop 967 mailed a letter to Mayor Jacobs in late 2012 explaining the need for a new traffic signal. The Troop highlighted safety concerns because of traffic issues and the heavy flow of pedestrians during the school year. Their request prompted county officials to study the intersection near the school. After a traffic study was conducted, which included a review of traffic counts and crash data at the intersection, County officials found the study justified the need and recommended that a new traffic signal should be installed near the school’s intersection. “The Girl Scouts have made Orange County a better place to live through their involvement in local government,” said Orange County’s Traffic Engineering Division manager Ruby Rozier. “Having leadership in the community that listened and helped to make the girls’ idea a reality is just wonderful,” said Cheryl Kendall, the mother of Girl Scout Sarah Kendall. Mayor Jacobs met with the group of Girl Scouts last year and told them that the new signal would move forward. The signal was then designed and constructed. “It feels great that we made getting to school safer for the students who walk to school,” said Bri Whigham, 9, a member of Troop 967. The project included the relocation of overhead power lines, which was completed in time for the school year. “Girl Scouts can change the world, and our girls are proof of that,” Nikki Botwinik, Girl Scout Junior Troop 967 leader, said. Girl Scouts of Citrus is the premier leadership organization for girls in Central Florida, currently serving more than 14,000 girls, kindergarten through 12th grade, throughout Brevard, Lake, Orange, Osceola, Seminole, and Volusia counties. For more information about Girl Scouts of Citrus or the Girl Scout national leadership program, visit the Girl Scouts of Citrus site or call 1-800-367-3906. A collection of photos from the traffic signal event are available on Flickr for use by the media.